This is a synopsis of my personal highlights since finding CrossFit in fall of 2005: a CrossFit community curriculum vitae, coach's resume, or whatever you'd like to call it. CF Level 1 Trainer cert Oct 2007. Held on base at Quantico, VA with the luminaries of the day, including Coach Glassman, Eva Twardokins, Tony Budding, Jeff Martone, Dave Castro and yeah--Buddy Lee. Ran CF Camp FLP, on Balad Iraq spring 2008. Unofficial affiliate, really just a group of staff weenies trying to not get fat off chowhall food, but I met great people. 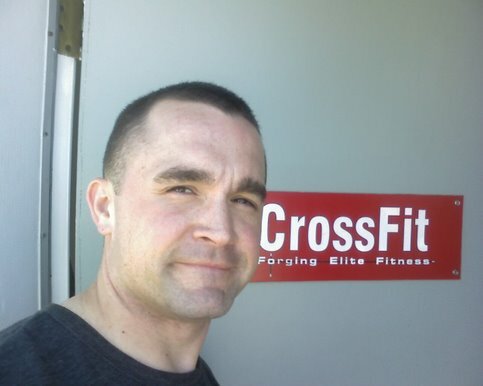 Co-Founded CrossFit Fort Meade Aug 2008. More great people, great WODs and my first real 'home' affiliate. To this day when people ask my home affiliate, I still lay claim CFFM first. CrossFit Gymnastics Trainer Cert Feb 2009 What can you say about Tucker? Control of one's body in time and space is the start to great strength and skill. Organizer, Judge and Participant: 2009 National Capital Region Military Affiliate Throwdown. Possibly the worst CF competition of all time. I was there, I know. Truth be told it was mainly my fault. We were ambitious, perhaps to a fault. We live and learn. CrossFit Kettlebell Trainer Cert Mar 2009 There's more to using KBs than swings and propping the door open, it's true--I'll show you. CrossFit Endurance Trainer Cert May 2009 Although I enjoy running I hate to run. Years of injury are why I hate it. Learning to P.O.S.E run from BMac has helped me still be good at it, despite the hate. Organized & Led 6 CF Affiliates particiation in US Naval Academy Combat Fitness intramural sports class, spring semester 2009. CF BWI, CF Diesel, CF Fort Meade, CF Ocean City, South Baltimore CrossFit and CrossFit Bethesda trainers all descended on the Naval Academy in Annapolis, MD for 8 classes over 10 weeks teaching the basics of functional fitness vis-a-vis CrossFit to about 150 freshmen midshipmen. CF Level 2 Trainer Cert, Oct 2009. Very proud to say that the OGs at CFFM invited me back for their seat when they hosted a L2 cert there. Even more so that I didn't let them down--I passed when probably 2/3 didn't. The CF HQ personnel were great to learn from, and the L2 trainees I met there are all incredible people. Judge, 2009 Mid-Atlantic Hopper Challenge. I wish I could be a part of this every year, and if I get back to the right coast I will, Ryan puts on a great competition and he's a class act. Organizer/Judge: 2011 Camp Leatherneck CrossFit Throwdown. The Leatherneck Throwdown was a lot of work in miserable conditions, for the trainers and the athletes, but it was freaking amazing. Team Captain, CrossFit Leatherneck Redeployers Affiliate Cup Team. Did we do too badly, all things considered? Nope, we threw it in the ring. My personal standing of 339th in SoCal and 3953rd in the world are much better to me than anyone who stood back on the sidelines. Maybe we'll all fare much better next year if we're not deployed to Afghanistan for a yerar prior, inluding the first two weeks of the Open and traveling around the world week three to get home. Judge, 2011 Reebok|CrossFit Games. This was an incredible experience. Two days surrounded by awesome people, being a part of the biggest thing going on in the CrossFit community. This year I was lucky enough to judge the Masters' events all day on Friday and Saturday, then go down to help out on the 'killer cage' team WOD on the main floor. The athletes, the event, the WODs, all of it was incredible. Coach, CrossFit Monterey. Moved to NorCal to study at Naval Postgraduate School, fell in on the only affiliate on the Peninsula when I realized the futility of trying to run a military affiliate while pursuing a masters degree. Great people, lots of fun. Well, that's about it, I'll add anything else fun and exciting I manage to pull off as it occurs.